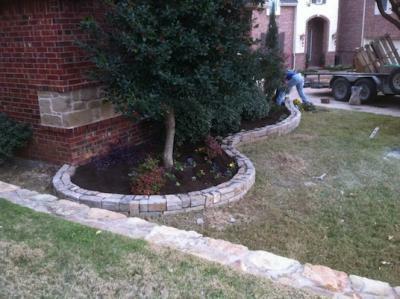 Create curb appeal with GroundScape, Fort Worth Landscaping Company. We all know the saying “you only get one chance to make a first impression.” The same is true with your house. The front yard is usually the first impression people have of your home. In a slower housing market this impression can be what intrigues or attracts a buyer to look at a home. Creating curb appeal can make or break the sale of a home. Many buyers have difficulty visualizing the potential of a home’s landscape. Providing a well maintained yard can create comfort for the potential buyer as they view the interior and exterior elements of a home. Keep lawn areas mowed and fertilized. GroundScape, a Fort Worth Fertilization company can set you up on their Essentials Program. A well kept lawn and its surroundings will let a buyer know that the house is well cared for. Pull or spray weeds that may be growing in planter beds and look for grasses growing up through walkway cracks. A persons opinion of a home will begin to develop as they walk towards the front door. Keep this area clear of debris and consider adding seasonal color along the walkway. A decorative pot of bright colored flowers is always a welcome at the doorway. Don’t forget about the backyard. This area may not be visible from the road but can be just as important as front yard curb appeal. A few quick ways to brighten up the backyard include coloring existing concrete, adding seasonal color to flower beds and adding lights to brighten the yard and patio area. Lighting can be a quick fix to enhance evening curb side appeal. Outdoor lights can be placed along driveways and walks to welcome guests. GroundScape, a Fort Worth Landscape Company, installs and maintains outdoor lighting. They can also be strategically placed to illuminate shrubbery and other landscape elements. The shadows cast by lighting can create a beautiful look for a home. Lights can also be added to the exterior of the house to enhance the visibility of an entry way and add architectural interest.